The European Union adheres to strict data privacy regulations. These regulations used to be known under the Safe Harbor Framework. In late 2015, a European Court deemed the Safe Harbor Framework as invalid and inadequate to support EU data privacy laws. Since that time, the U.S. Department of Commerce and European Commission have created two methods to support the EU data protection laws. These methods enable businesses on both sides of the Atlantic to work together and share data in a manner that is legal and adheres to the EU’s laws. 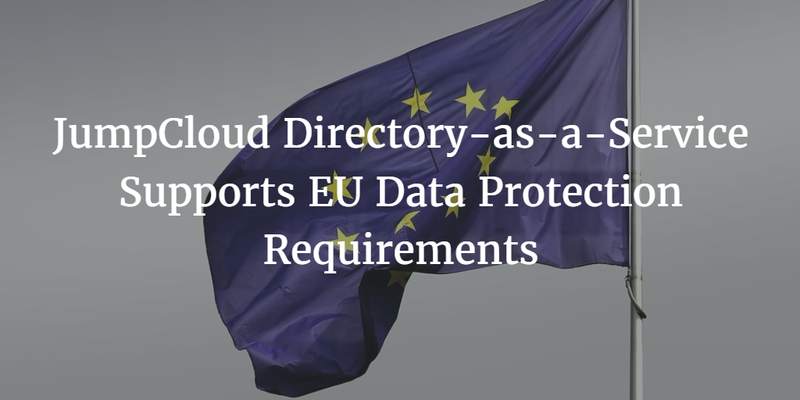 JumpCloud’s Directory-as-a-Service® supports EU data protection requirements. The two methods to comply with the EU’s regulations include the Privacy Shield Framework and the EU Model Clauses. The Privacy Shield approach enables an organization to self-certify that their infrastructure and procedures comply with the EU’s data privacy regulations. A simple attestation by the company along with referencing Privacy Shield creates compliance. The EU Model Clause approach leverages standard legal documents created by the European Commission. Companies doing business together sign these standard documents to create the legal relationship. That also creates enforcement for the EU data protection requirements. The JumpCloud Directory-as-a-Service platform supports the EU’s data protection requirements. JumpCloud has taken the approach of signing the EU Model Clause with organizations based in the EU. We are happy to work with your organization to communicate how JumpCloud supports these EU requirements. Also, if you would like to do business with JumpCloud and have the EU Model Clause requirements signed for your implementation, just drop us a note.